Now that summer has officially arrived, I want to look ahead to some of the events in nature that we can expect over the next three months. As a result of climate change, however, the actual timing of events is becoming less predictable. This was especially true last fall when unprecedented warmth and drought delayed and weakened the intensity of the fall colours. It was exactly 30 years ago that NASA climate scientist Dr. James Hansen appeared before Congress, where he predicted how human-made emissions would impact the climate. As it turned out, the predictions he made in 1988 were almost entirely on target. As emissions have soared, the planet has warmed relentlessly; every year of this century has been hotter than 1988. This past May was the warmest on record in the U.S. As he predicted, the ocean is rising at an accelerating pace, the great ice sheets in Greenland and Antarctica are melting, coastal flooding is rapidly increasing, and the Arctic Ocean ice cap has shrunk drastically. Despite all of this, conservative politicians across Canada want to get rid of carbon taxes and undo the meagre progress the country has made in addressing climate change. Let’s not forget that on a per capita basis, Canada is the biggest greenhouse gas emitter in the world. This past spring, we had several reminders of the impact climate change is having on nature in the Kawarthas. On May 4, Peterborough was hit by a major windstorm with gusts up to 120 km/hr. This was the worst storm to hit the city since the ice storm of April 2013. Numerous trees were blown down, including a tall spruce on Maple Crescent that literally snapped in half. Dozens of other spruce were uprooted across the city. At the corner of Monaghan and Lansdowne, nearly half of a huge iconic oak tree came down, as well. The number of trees that have been destroyed by ice and wind in Peterborough and the Kawarthas in the past couple of decades is a tragedy. The demise of many ornamental, non-native cedars in the Kawarthas also has a probable link to climate change. Wild temperature fluctuations this winter -especially in February with four days above 11 C – caused freeze-thaw cycles that put stress on the trees, causing them to turn brown and, in some cases, die. The following events in nature are typical of summer in the Kawarthas. 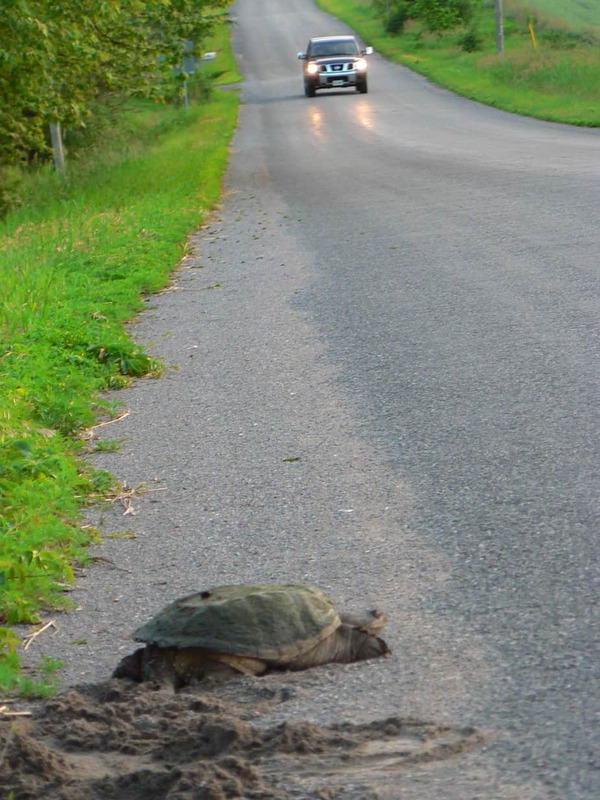 Turtles can still be seen along roadsides and rail-trails laying their eggs. Remember to slow down in turtle-crossing zones. 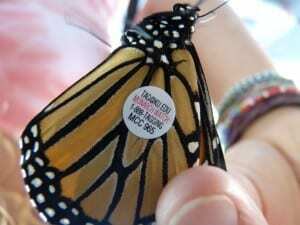 Monarch butterflies have returned – the “grandchildren” of those that flew to Mexico last fall. Local Monarch numbers appear encouraging so far this year. Make sure your garden has a selection of different plants blooming from spring through fall to provide pollen and nectar to bees and butterflies. It’s also important to have some milkweed on which Monarchs can lay their eggs. Both Swamp (A. incarnata) and Butterfly (A. tuberosa) Milkweed are the best choices for small gardens. 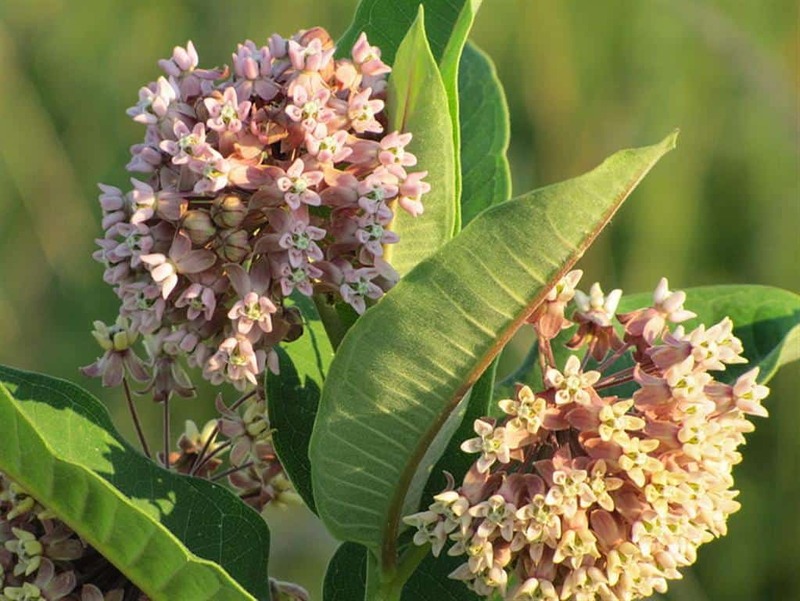 Common Milkweed is in flower and its rich, honey-sweet perfume fills the early summer air. The scent serves to attract insects whose feet will inadvertently pick up the flowers’ sticky pollinia – small packets containing pollen – and transfer them to another plant. A huge number of other plants are blooming, as well. In wetland habitats, watch for Common Elderberry, Swamp Milkweed, Joe-Pye Weed, Yellow Pond Lily and Fragrant White Water Lily. Along roadsides and in meadows, common species include Bird’s-foot Trefoil (often on lawns), Ox-eye Daisy, Yarrow, Viper’s Bugloss, Black-eyed Susan, Queen Anne’s Lace, Wild Bergamot, Purple-flowering Raspberry and Orange Hawkweed. 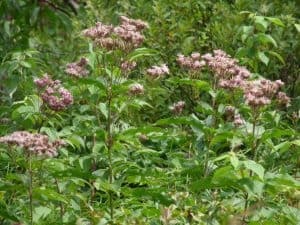 July is a good time to learn the common, non-native invasive plants. Some of the most noticeable roadside denizens are Wild Parsnip, Dog-strangling Vine and Phragmites (Common Reed). 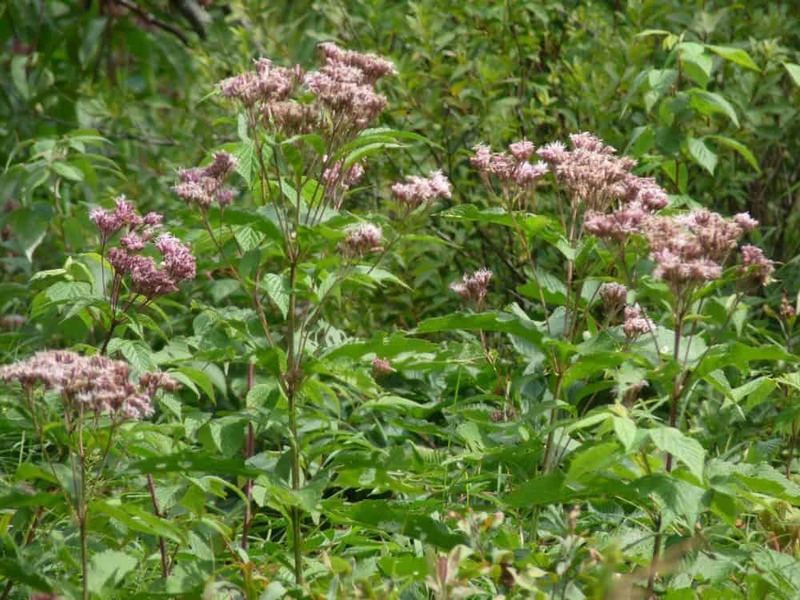 For more information, contact the Ontario Invasive Plant Council at ontarioinvasiveplants.ca. July is infamous for deer, horse and stable flies, which belong to the Tabanidae family. Deer flies have black-patterned wings, iridescent eyes and tend to fly around your head. Horse flies are larger, grey in colour, and have huge eyes. They prefer to bite lower on the body. Stable flies are house fly-size and have four dark stripes on the thorax. They often attack the ankles and are very difficult to swat. Stable flies lay their eggs on rotting vegetation along shorelines and often show up at cottage docks. It is hard to go anywhere near water in July and not notice dragonflies and damselflies. Many turn up in suburban gardens. 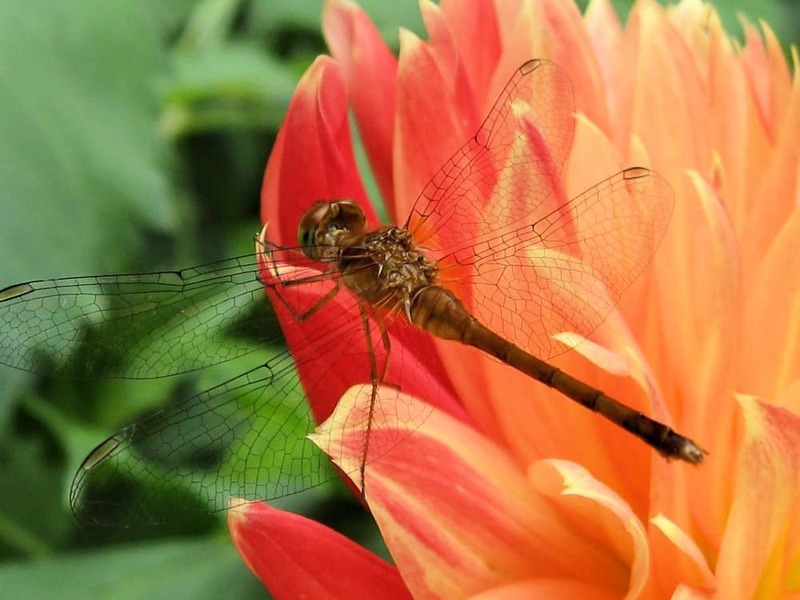 To tell them apart, remember that dragonflies have thick bodies, are strong fliers, and their wings are open at rest. Damselflies are usually much smaller, have thin bodies, are weak fliers, and their wings are closed or only partially spread at rest. Some of the most frequently seen damselflies are powder-blue in colour, hence the common name of “bluets.” As for dragonflies, some common species include the Dot-tailed Whiteface, Common Whitetail, Four-spotted Skimmer and Chalk-fronted Skimmer. Go to odonatacentral.org/ for pictures of all Ontario dragonflies and damselflies. Click on “checklists” and then type “Ontario” in the search box. By mid-July, the buzzy, electric song of the Dog-day Cicada fills the void created by the decrease in bird song. Watch for mushrooms such as White Pine Boletes and Fly Agarics. Summer – not fall – usually produces the greatest variety of fungi. Quiet country roads with lots of thick cover can be good for summer birding. If you hear contact calls, stop and pish. Warblers such as American Redstarts often fly in quite close. Listen for the high-pitched “lisping” calls of Cedar Waxwings and the “po-ta-to-chip” flight call of the American Goldfinch. Watch for waxwings on the branches of dead trees along the River Road between Trent University and Lakefield. Late July through September offers some of the best shorebird watching of the year. The Nonquon Sewage Lagoon, located just north of Port Perry, is the destination of choice. A ten-dollar permit is necessary, however. It can be purchased at Durham Region Transfer Site at 1623 Reach Road, Port Perry. Call 905-985-7346 ext. 112 for more information. By mid-August, Ragweed is in full bloom and its pollen has hay fever sufferers cursing with every sneeze. Goldenrod, which relies on insects to spread its sticky, heavy pollen, is not the culprit. The small, green flowers of the Ragweed, however, rely strictly on the wind to spread the ultra light, spike-covered pollen grains. The higher CO2 levels associated with climate change are greatly increasing pollen production. It is also causing Poison Ivy to thrive. Small dragonflies known as meadowhawks abound. Mature males are red, while females and immature males are yellowish. Cottagers sometimes find large, mysterious, jelly-like “blobs” attached to the dock or aquatic plants. They are formed by colonies of Bryozoa, a freshwater invertebrate. Looking somewhat like an egg mass, the clumps are clear, dense, and have distinct, repetitive patterns and markings on the outside. Bryozoa are like a freshwater coral in that the mass they form is actually a colony of thousands of zooids – roughly analogous to polyps in corals. Each tiny zooid has whorls of ciliated feeding tentacles that sway back in forth to catch plankton in the water. Bird migration is in full swing by mid- to late August, with numerous warblers, vireos, flycatchers and Common Nighthawks moving through. One of the best places to see nighthawks is Back Dam Park near Warsaw. Migration peaks around August 20. Go in the evening and watch the sky for loose flocks. Goldenrods reach peak bloom at month’s end and become the dominate flowers of roadsides and fields. These plants are veritable insect magnets, drawing in an amazing variety of species with their offerings of pollen and nectar. 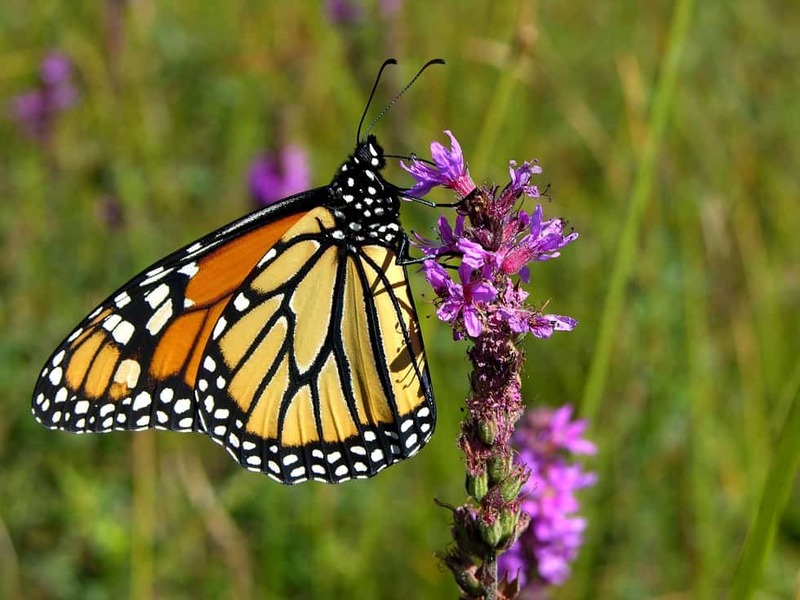 Monarch butterfly numbers are at their highest. 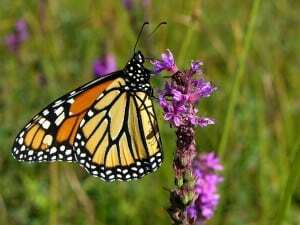 Monarchs congregate at peninsulas on the Great Lakes such as Presqu’ile Provincial Park, a jumping off point for their migration across Lake Ontario. 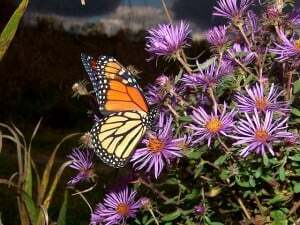 Don’t miss the Monarch tagging demonstration at Presqu’ile on the afternoon of September 1 and 2. Monarch expert Don Davis will be on hand to answer questions and even let your kids release a tagged butterfly. Go to friendsofpresquile.on.ca for more information. Chinook and Coho Salmon leave Lake Ontario to spawn in tributaries of the Ganaraska River. Huge salmon can be seen jumping up the fish ladder at Corbett’s Dam on Cavan Street in Port Hope. By late September, asters reign supreme. Their purples, mauves, and whites light up fields and roadsides and bring the year’s wildflower parade to a close. The most common species include New England, Heath, Panicled and Heart-leaved Asters. They make a great addition to any pollinator garden. 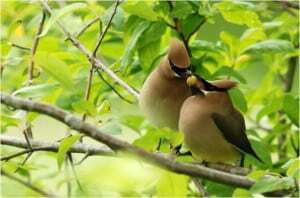 Be sure to put your bird feeders up this month. If you scatter millet or finch mix on the ground, you should be able to attract White-throated Sparrows which migrate south in late September. Most years, Virginia Creeper vine, Poison Ivy, Chokecherry and Staghorn Sumac reach their colour peak at about the fall equinox, which occurs this year on September 22.